Riding a wave of elite-targeting anger and general populism to an unprecedented level of power in order to break down the establishment and give the people security and order is beginning to become en vogue. Last week, we had the inauguration of Donald Trump. This week, we’ve got Steve Rogers with echoes of the same. Civil War II may have ended in the twilight of 2016, but its story wasn’t really over until today’s release of The Oath, an epilogue by Nick Spencer, Rod Reis, Phil Noto, Raffaele Ienco, Szymon Kudranski, and Dono Sánchez-Almara, which closes the book on the saga while setting up Marvel’s big plans for its sinister take on Steve Rogers and its upcoming Secret Empire event. 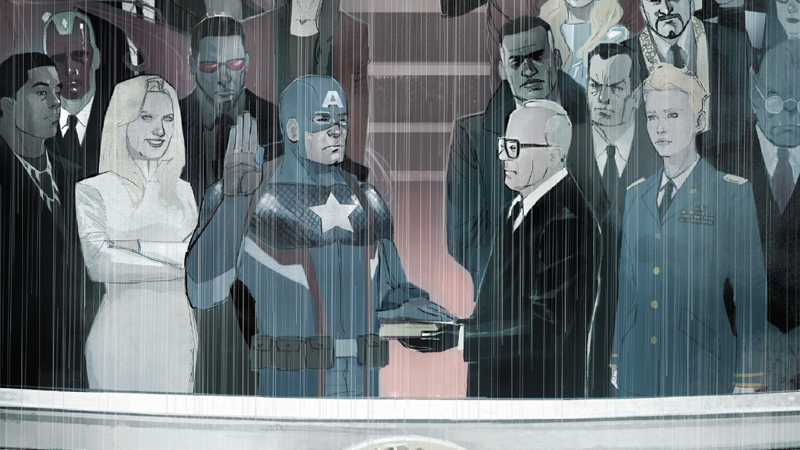 The Oath mainly focuses on the latter rather than the former, as it flits between the unprecedented “inauguration” of Captain America as the new head of SHIELD (complete with equally unprecedented bonus dystopian powers in the name of freedom and security, natch) and a heart-to-heart Steve has with the comatose body of Tony Stark. For all intents and purposes, Civil War II is done with the story, but the sentiment it’s left behind—a distrust of the elite ruling class of superheroes amongst the general populace—is what drives Steve into making his opening moves in the bid to make Hydra the ruling power of the United States. Unlike the recent revelation of Steve’s incredibly, comically villainous plan to get aliens to invade the Earth, which was revealed in the pages of Captain America: Steve Rogers, this feels all very “ripped from the headlines,” from Steve’s faux-inauguration as head of SHIELD being interspersed with shots of talking-head news broadcasts that wouldn’t have felt out of place in last year’s coverage of the U.S. election, but with more references to Captain America. Even Steve himself borrows some talking points from post-election discourse, as he lambast’s Tony’s unconscious body with tales of the common man, embittered by a liberal elite condescending to them—with the rights of LGBTQ Americans and other minority groups standing in for Mutants and Inhumans alike. A world where the minorities of the Marvel universe are rounded up in camps, where dissent is hunted down and rooted out in the name of patriotic allegiance. A not-so-secret new Hydra Empire. And now that Steve Rogers is in power, we’ll slowly start seeing his dream coming to fruition over the next few months.